This is a substantial and warming meal that is great paired with cauliflower rice or rice. You can adapt it to your own level of preferred spiciness by adapting how much chili powder you include. This is a slightly spicy version. First make the meatballs. Combine all ingredients in a large bowl and mix well. Now, make around 15 golf ball sized meatballs. Wet your hands before making a ball so they won’t stick to your hands. Put them on a plate and let them firm up in the fridge for about 30 minutes. 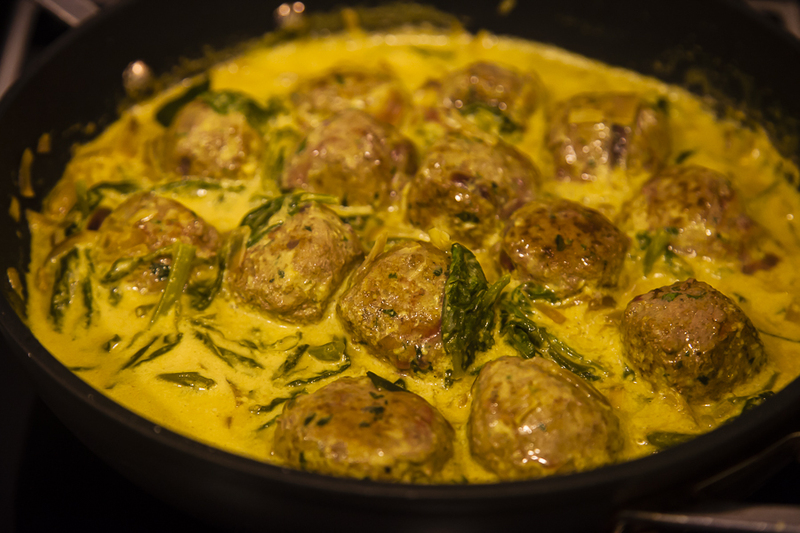 Heat the ghee or oil in a large frying pan and brown the meatballs on all sides. When ready, put them on a plate and set aside. When all the meatballs are done, fry the curry leaves and cardamom pods for a few seconds until fragrant. Add the spices and the ginger-garlic paste and fry for a minute more. Then add the coconut milk and water and bring to the boil. When boiling, add the spinach, cover and cook until wilted. Take the lid of, add the meatballs, season with salt and pepper and cook until the sauce thickens a little and the meatballs are heated through.